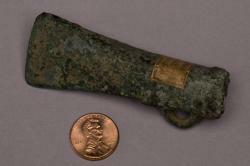 These bronze axes are unusually small, just half the size of a typical axe. Made in Europe some 5,000 years ago, they are similar to small tools found throughout the continent. Some scientists think these were used by children, perhaps for cutting wood or plowing fields. In pre-industrial cultures, young children often work alongside adults, helping the family survive. For example, prehistoric copper mines in Great Britain and Turkey contain passages so small—just a foot across—that only a child could have worked there. It’s not too hard to imagine children also using tools like these to work around the house, forest or farm.